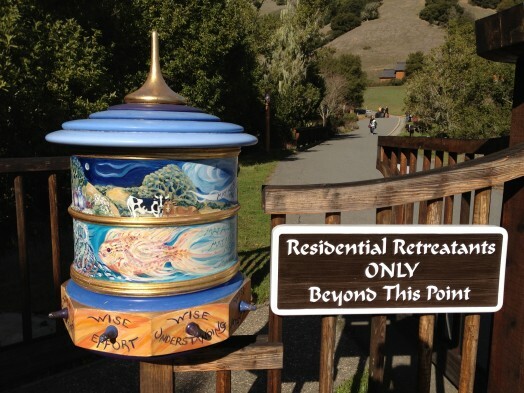 This year I attended my second silent meditation retreat at Spirit Rock Meditation Center, ten days focusing on vipassanā (insight) meditation. Since people generally ask about or react to the “silence” aspect of attending a silent meditation retreat, picturing the challenge being going ten days without talking, I’ll say that’s not the challenge or point of a retreat at all. If interested, it’s easy to understand it this way. For people that meditate on a regular basis, attending a silent retreat is really no different than students heading to the library to study, or upholding the no talking rule during a college exam. You and everyone around you needs and wants to maintain the quiet in order to focus on the actual task at hand. As such, there’s no challenge in “not talking.” It’s just the opposite. It becomes pretty difficult if others start talking around you. The real challenge is keeping undivided attention on the material or exam directly in front of you, or in the case of insight meditation, being quiet enough, creating enough stillness to explore the depths and to observe the basic workings of your mind and experience. Like a library, the quiet atmosphere and others studying around you is the favorable condition which makes the challenging process of studying your mind a little easier. Understanding this, a better question about an insight retreat experience is not “what is it like to not talk for ten days” but “what did you learn?” Of course, that’s often asking a deeply personal question so I wouldn’t expect an answer but you can look for changes in a person’s pre and post retreat behavior or way of being. If curious, you can try an insight retreat, but only if you can picture eating vegetarian food for a week, amazing food, can summon a student mentality and not talk for a short period, ten days is really nothing, and at the core of it, the real challenge — face yourself — commit to sitting with and carefully observe your mind for ten days and not move, no matter what comes, the good and difficult, and what you find and learn about yourself in the process. This is, at least in part, the challenge and opportunity of a vipassana (insight) meditation retreat. And if you’re afraid of not talking for ten days or what might happen, that is a perfectly reasonable place to begin looking at your mind. This entry was written by Brian McNitt, posted on at 3:29 pm, filed under Zen. Bookmark the permalink. Follow any comments here with the RSS feed for this post. Post a comment or leave a trackback: Trackback URL. I really enjoyed reading this & thank you for sharing. If you’re able to discover/learn more about yourself in the end, and be present, that is a reward in itself.